Genes involved in Parkinson’s disease and amyotrophic lateral sclerosis are emerging as ever more entwined thanks to their key roles in the disposal of damaged or old mitochondria. In August, researchers led by Richard Youle at the National Institute of Neurological Disorders and Stroke in Bethesda, Maryland, delineated how the familial PD genes PINK1 and Parkin work upstream of the ALS genes Optineurin and TBK1 in the disposal process called mitophagy (see Sep 2015 news). Now, reporting in Molecular Cell online September 10, Wade Harper and colleagues at Harvard Medical School flesh out how the kinase TBK1 tightens the bonds between ubiquitin chains on the mitochondrial surface and either Optineurin or another mitophagy protein, NDP52. Strengthening those ties promotes mitophagy, the scientists report. Research suggests that stressed mitochondria call in Parkin and PINK1, which add ubiquitin molecules and phosphate groups to the damaged organelles. The ubiquitin chains then recruit autophagy receptors such as NDP52 and Optineurin, which recruit the full autophagy apparatus. 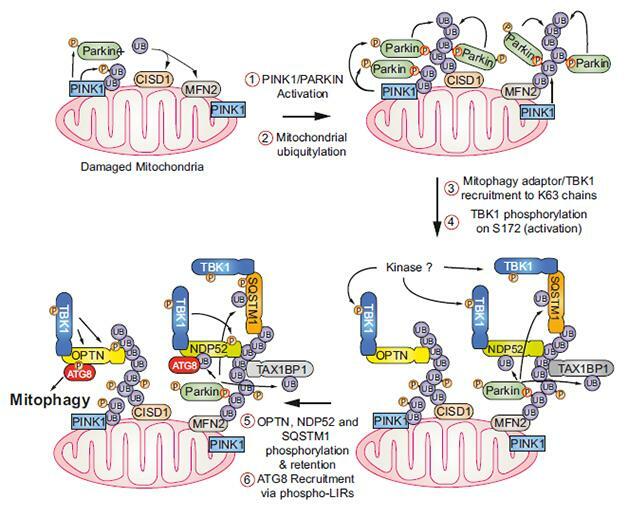 Without TBK1, which activates Optineurin by phosphorylating it, mitophagy does not proceed. 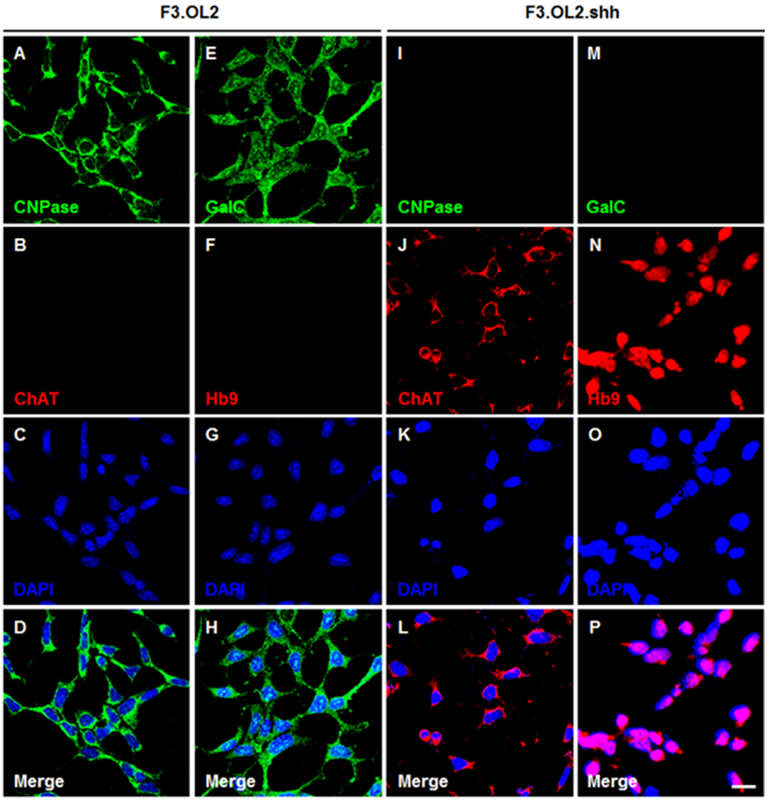 Now, first author Jin-Mi Heo and colleagues reveal why mitophagy stalls without TBK1. They found that in HeLa cells, Optineurin and TBK1 bind in the cytoplasm and that when Optineurin finds a ubiquitin chain on a damaged mitochondrion, it takes hold of that chain, but loosely, pulling TBKI along. Once the complex attaches to the organelle, an as-yet-unknown kinase phosphorylates TBK1, activating it. The active TBK1 then phosphorylates two sites in Optineurin’s ubiquitin-binding domain, increasing its grip on the mitochondria. Now firmly attached to the organelle, Optineurin recruits the autophagy machinery. Moreover, the researchers found evidence that TBK1 binds and phosphorylates NDP52, too, though they have not confirmed the specific amino acids that TBK1 modifies. Study co-author Alban Ordureau suspects those two cooperate in a similar manner to TBK1 and Optineurin to promote autophagy. Ordureau and Heo pointed out they also disagree with some findings from the August report. While Youle and colleagues suggested Parkin was dispensable for mitophagy, Harper and colleagues determined the organelles were unable to recruit Optineurin and TBK1 without Parkin. They also posit that while phosphorylation of ubiquitin chains recruits Parkin, Optineurin and NDP52 can interact with unphosphorylated chains. To view commentaries, primary articles and linked stories, go to the original posting on Alzforum.org here. Copyright © 1996–2016 Biomedical Research Forum, LLC. All Rights Reserved.